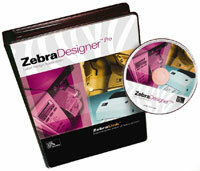 Zebra’s new ZebraDesigner™ v2 label design software products make creating complex labels click-simple. Updated with a host of new enhancements, these new editions make creating label designs even easier. Zebra has updated the entire product family—ZebraDesigner, ZebraDesigner Pro, ZebraDesigner for XML and ZebraDesigner for mySAP™ Business Suite—to help end-users get the most from their Zebra printers while using the latest versions of Windows. The no-charge, limited-feature “ZebraDesigner” product has also been updated to v2.